If you're following Southern In-Law on Facebook, Twitter or Instagram - you would have seen that we had a cookie cake for Jesse's birthday on Wednesday! I asked Jesse again and again what kind of cake or dessert he wanted for his birthday and he kept saying nothing. Well... you have to know that's not going to happen! Jesse is always asking me for cookies and I made a batch when he got home which he said was perfect - so I decided a Cookie Cake would be the perfect cake to celebrate with. 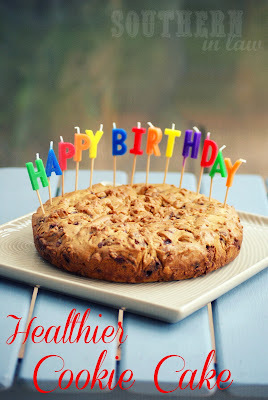 You all know that I love making everyones' favourite dishes better for you - so of course I had to make this cookie cake healthier too! Now, on the interwebs, you'll find plenty of healthier cookie recipes made with beans or funky flours - but not here on Southern In-Law! When I make a recipe healthier, I want to do it using ingredients you already have at home - and I want to make it taste even better than the original - not just like a healthy replacement. This cookie cake uses butter - but only a very small amount! As a receive emails all the time asking if you can use butter substitutes and margarines in my recipes, I tested this out too and I can tell you that it works perfectly in this cookie cake. Whilst I made a regular version for my family, I also whipped up a gluten free version for myself which worked perfectly - so this is a cake that can be anyone's birthday treat! Grease and line a 6-8" cake tin, set aside. Cream your butter and sugar until light and fluffy. Add in your egg and vanilla, mixing until combined. Gradually mix in your flour, baking soda and salt - mixing on a low speed until combined. Mix in your chocolate chips until evenly dispersed throughout the dough. Place your cake tin into the oven, baking the cookie cake for about 30-45 minutes or until golden and cooked through**. Once cooked, leave your cookie cake to cool before removing from the tin. 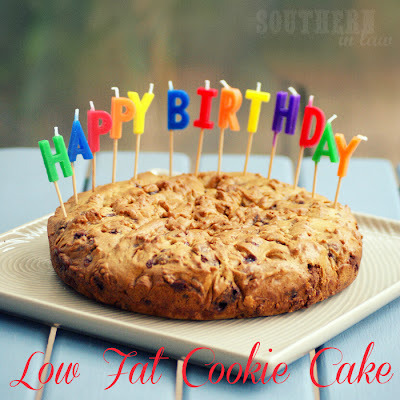 **If your cookie cake begins to brown too much, place some foil over the top of the tin and continue cooking. So tell me, what's your birthday cake of choice? I'm a chocolate girl (as if you didn't already know that) but I also love Carrot Cake and Banana Cake - so it's always a tough decision as to what I want for my birthday! Last year it was my Healthy Chocolate Brownies which are always a winner with everyone! Don't worry that Google Reader is closing, follow Southern In-Law on Facebook, Twitter, Instagram, Pinterest, Bloglovin and Feedly. You can alsovote and nominate Southern In-Law for some upcoming blog awards! Awh, thank you Marcia - you're so sweet! Jesse decided this cookie cake was so good, he never wants anything else for his birthday, haha. You'd have to choose carrot cake because banana cake is too 'everyday' haha. I loved ice-cream cakes or caramel mud cake from the cheesecake shop! I totally agree with your recipe makeover philosophy - it has to be use easy ingredients and it has to taste even better than the original. This cookie cake looks like a fantastic example of both these requirements. Haha, the only thing better than cookies is a cookie cake, I say! Looks delicious :) My favorite is Funfetti/confetti cake...but I am a big carrot cake fan too! Thanks Merry! It was delicious. I've never had a funfetti cake - but as a lover of sprinkles, I'm sure it'd be good! I LOVE Giant Cookies & love how fluffy this one looks, so delicious - I will let you know what my other 1/2 thinks after his birthday! Cake did not come out well. Very dry and barely rose. You need to replace extra the butter that was taken out of the recipe with something to keep the cookie moist...maybe Greek yogurt, dates, banana, or avocado would work. Oh really?! I've made it three times and it's worked perfectly! What ingredients did you use? Gluten free or regular flours? You can become a reseller for an existing hosting company. customer service that will help solve your problems.